Our deep rooted firm is engaged in offering an optimum quality assortment of Bulb Holder. Our experienced team of professionals manufactures this holder by making use of optimum quality raw materials and the pioneering technology. 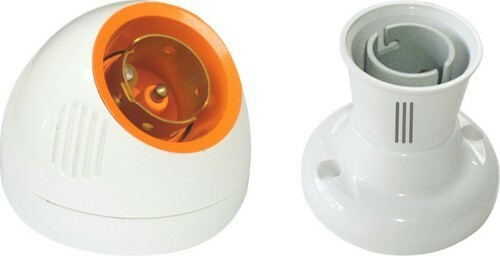 Widely used for holding bulbs or cfl tubes, this holder is put forth at negotiable rates for our clients. Founded in the year 2016, H.M. Marketing has gained an admirable position in manufacturing, wholesaling and trading of Panel Light, Street Light, Recessed Light, Switch and Socket and Door Bells etc. These products are immensely admired owing to their effortless operations, water resistance, longer operational life, top performance, low maintenance and nominal prices. Our offered products are developed employing the industry approved component and advanced technology. Furthermore, in order to provide the top series of products, these are tested on varied quality parameters employing advanced techniques. In addition, our firm has hired professional’s team who give full effort to develop and provide these products as per industry standards. Besides, our professionals follow worldwide quality standards in the engineering of our products.